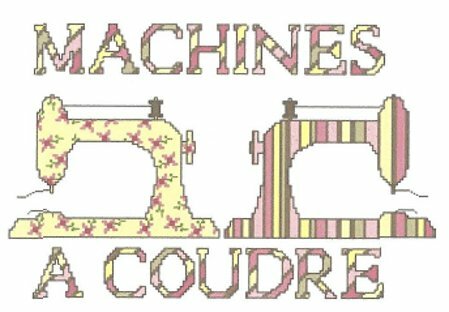 "Sewing Machine" is a counted cross stitch design by Alice & Co. It is part of a series called "la boîte à couture" (the sewing box). "Sewing Machine" is a counted cross-stitch chart with instructions translated in English. It is part of a series called "la Boîte à Couture" (the Sewing box). you can stitch them with or without the text. This pattern shows 11 colours (DMC references on the chart). Recommended Fabric: 18 count linen Aida or 32 count linen, colour "off white" or "very light sand (platinum)", dimensions 45x35cm (18x14 in). But you can use the fabric of your choice regarding the type (linen / evenweave / Aida), the stitch count and the colour.